The Niagara Apothecary is a wonderful tourist attraction for any family or couple visiting our historic town. Enjoy the splendor of this authentic museum restoration of a 1869 pharmacy. Take a step back in time to this unique shop that operated in Niagara-on-the-Lake, Ontario, from 1820 to 1964. A visit to the Apothecary museum is of interest for both its numerous architectural qualities in the building itself as well as its contents. Trace the history of pharmacy in the Niagara Region back to approximately 1818 when Rodman Starkwather originally opened the Apothecary opposite Smith's Tavern. Visitors can trace the history of the Niagara Apothecary from The Starkwather Years, thru the Harvey, Paffard, Randall, Cogne and Field Years. In addition to documenting the owners of the Apothecary and their practices, the museum also looks to put their years of ownership in context by providing historical information on relevant local and world events that shaped the pharmacy. 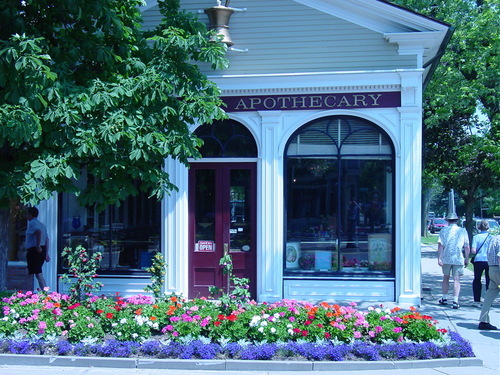 Whether as a trip to appreciate the building, its historical relevance in Niagara On The Lake or to spend time engaged in its many historical artifacts, the Niagara Apothecary is a key part of any Niagara On The Lake vacation for families, couples or singles!